~Vav~ A Hand of Blessing rooted in the material world, reaches the circle of the spirit. This larger version of the Heirophant holds more detail in the hand: fingernails and lines in the palm. ~Taurus~ The hand of blessing: fingers reach into the circle of spirit, the arm trailing in roots below into matter. The embodiment of these symbols is “religion” itself: A conduit from the spirit grounded into the rituals of daily life. The actions of everyday existence empowered with intent, reaching the divine, establishing a relationship with the Godhead. The central element is the blessing itself; the “art of bestowing the divine to each other” is what gives religion its lifeblood. 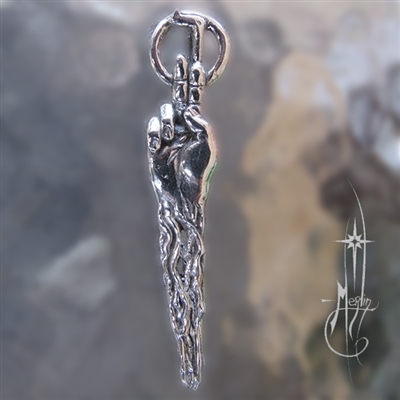 The Hierophant Amulet is one for teachers, nurses, healers of all kinds, clergy and any one who has chosen the path to serve the community through Teaching, Healing and Service. Sterling silver Amulet representing the Heirophant of the Tarot. 2 5/8” long, back bail for hanging on your chain or cord.